Questions were asked of the England international following a summer move from Arsenal to Liverpool. ALEX OXLADE-CHAMBERLAIN has hit back at the “stupid” criticism from Gary Neville and Thierry Henry following his £35 million move to Liverpool. After six years at Arsenal, the 24-year-old opted for a change of scenery in the summer of 2017 as his contract ran down in north London. There was a feeling that a man who was handed his England debut and place in Roy Hodgson’s Euro 2012 plans at the age of 18 had failed to fulfil his potential with the Gunners and was in danger of stagnating. Arsenal legend Henry claimed to have been “watching him for a very long time and I still don’t know what he’s good at”, while Manchester United icon and former Three Lions coach Neville said the Gunners had got a “brilliant deal”. Oxlade-Chamberlain has, however, played his way into form at Liverpool and blasted back at those who questioned him by saying: “Those comments are probably a bit stupid. “When you have watched someone long enough you know what they can do. “If it was aimed more at the end product side of things and doing those things that lead to scoring a goal or setting up a goal then fair enough, I will take those comments on the chin. Saying you don’t know what I do, when you have worked with me, I think is a bit stupid. He added: “It is not nice to hear it from your peers or people you have worked with and I have worked with them both in different capacities. “They can have their opinions. It cannot shake me. The important thing is that when I came here I had a manager [Jurgen Klopp] who had faith in me and he felt something different to that, and I had faith in myself. That is why I made the step. “Everyone says you have to be your own biggest fan and believe in yourself. 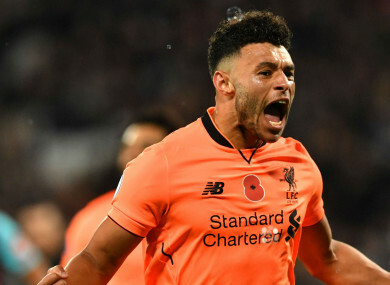 Oxlade-Chamberlain has contributed four goals and five assists to the Liverpool cause this season and believes there is still plenty more to come as he takes inspiration from those around him. He said: “There is more in me, I know I have to keep pushing on. I can take so much from someone like Mo Salah. Just look at him this season. It has been relentless and when someone can go from – obviously he is a great player – but to be competing with Harry Kane and Sergio Agüero for top goalscorer is something you have to learn from. “People probably wouldn’t have expected that from him at the start of the season. To put himself in that position is down to the mentality he has to work hard and get the best out of himself. Email “Oxlade-Chamberlain hits back at 'stupid' Neville and Henry criticism”. Feedback on “Oxlade-Chamberlain hits back at 'stupid' Neville and Henry criticism”.